Yes, Christmas is over and hopefully so is winter (more or less). Firstly please accept our usual apologies for the delay in this update. We are seriously thinking of changing to a quarterly update. Then we might be in with a chance of actually meeting our own deadline! Watch this space! Secondly - it seems that some people are under the mistaken impression that Pamela writes these updates. In fact it is a team effort. David is the author and Pamela is the editor. 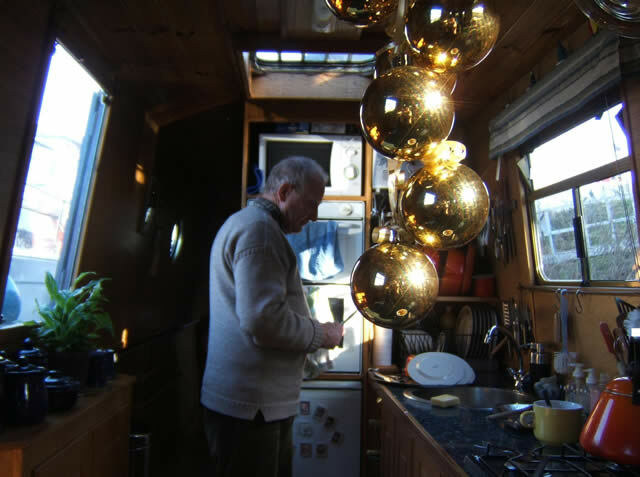 What usually happens is that David (who is the cameraman aboard Lea Crest) chooses some interesting photos and then writes a narrative to go with them. 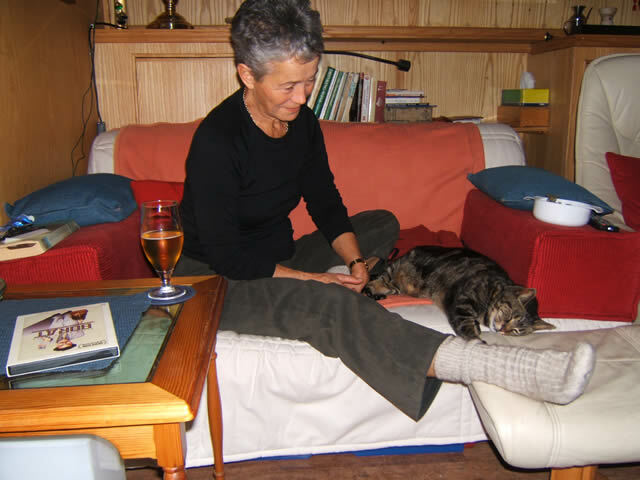 Pamela then proofreads/edits the text, combines it with the photos and then uploads the file to the website. Simple! So now that has been cleared up, on with our update, which this time is a backlog of 30 pictures we meant to post on the site much sooner. 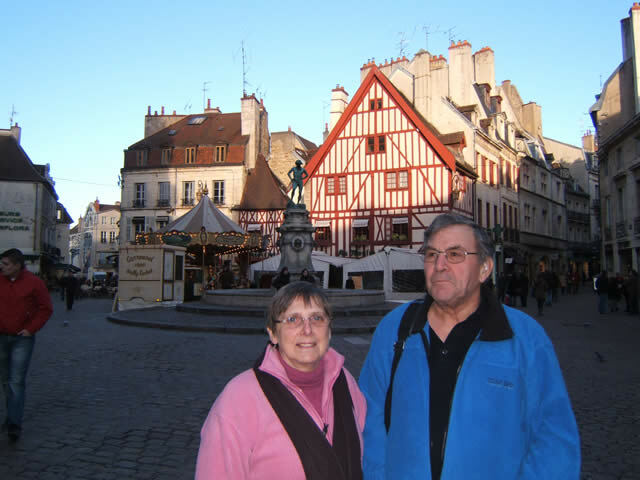 Our first photo is of Vivienne and Richard from New Zealand who live on their boat JOHANNES on the next pontoon to us here in St Jean de Losne. 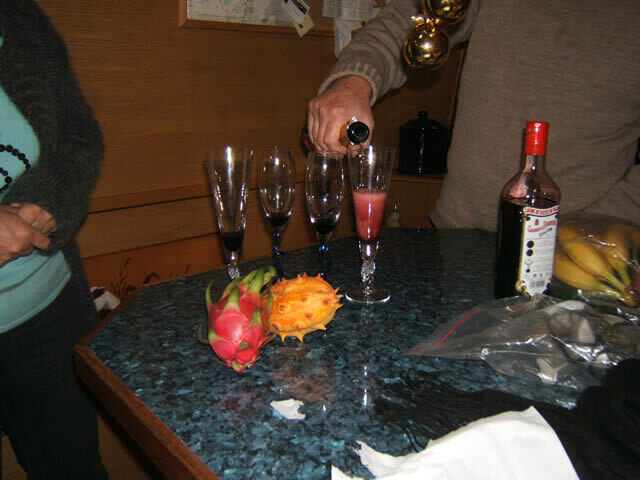 We try to have one evening each week together playing scrabble, dominoes, or simply just having drinks and a good old chat. But whatever we do it is always entertaining. 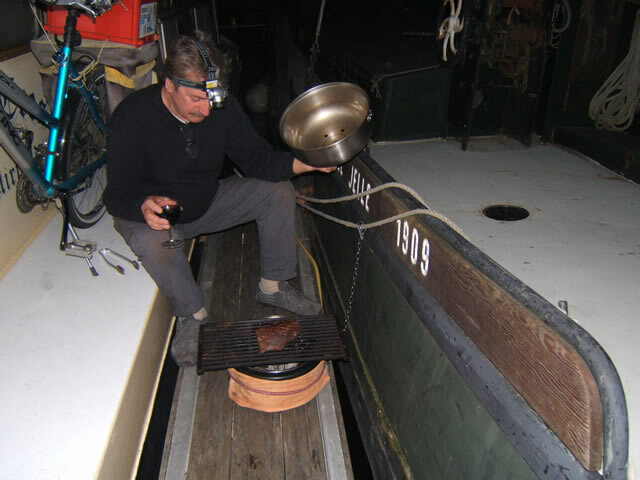 This next photo is of an attempt to cook a good steak out on the pontoon. But we don't think that the bars were getting hot enough. Won't be beaten though and will try again soon. Not sure where Richard was on this occasion but Vivienne came around for a little company (called Gromit). Gromit's fan club really is becoming global! 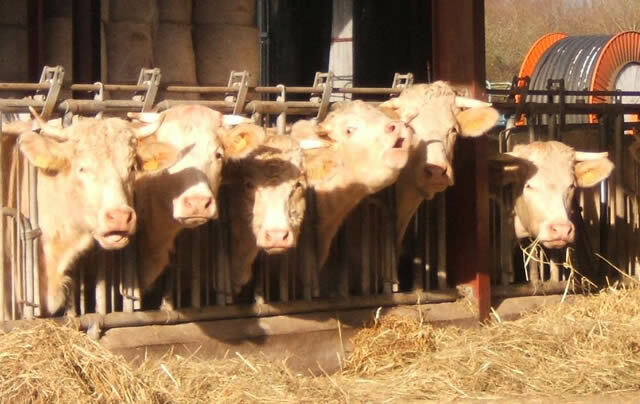 On our Lundi promenade (Monday walk) we often walk to a nearby village called Echenon and we pass by this group of Charolais cattle. As you can see from this next photo, they are quite interested in any passers by and are very vocal. 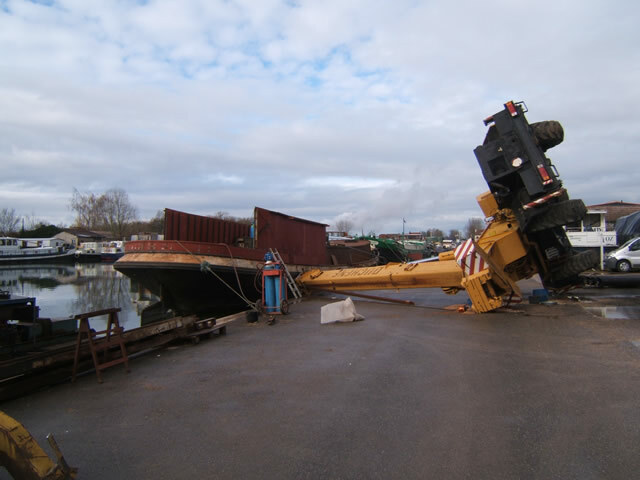 Even in the winter there are jobs that need to be done on the boats here and often there is a need for a crane. But it helps if you get one that doesn't fall over! 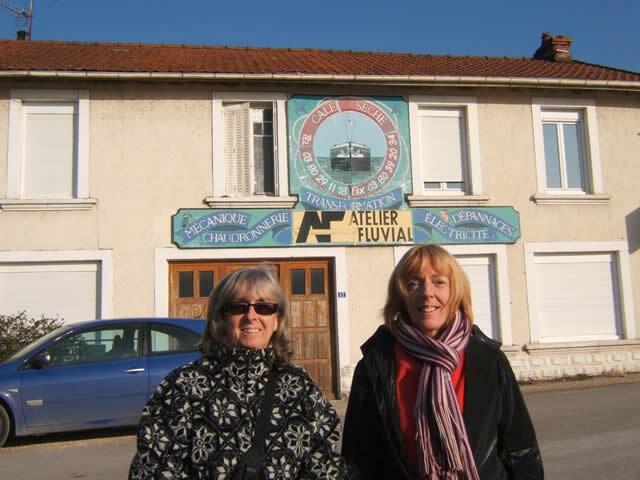 It was soon time for the "River Rats" Christmas dinner, which this year was held in the village of Saint Aubin, a lovely village about 10 minutes drive away. The venue was a pretty little building which is very old but superbly renovated and used by the local community for all sorts of events. This year they even organised some French lessons, which have been very successful. 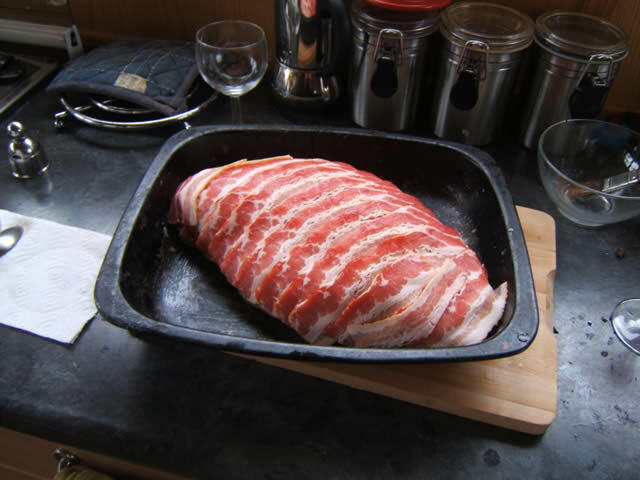 We offered to cook the meat this year and the next 2 photos show how it looked before we did. Unfortunately we do spend a lot of time socialising, so no apologies for any future photos of such activities. This was Paul on DILLYKIM just sorting things out before pouring us all a drink. Whenever Paul and Val visit Grand Frais (our local super fruit, veg and fresh fish shop) they always find some obscure item to bring home and here you can see a prime example. What strange looking things! This autumn/winter we met Paddy and Liz for the first time. 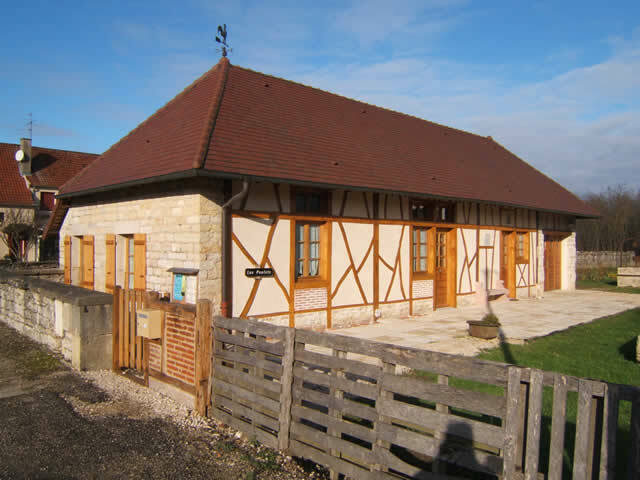 They have recently moved into a little village just down the Saône, about 30 minutes drive from St. Jean de Losne. 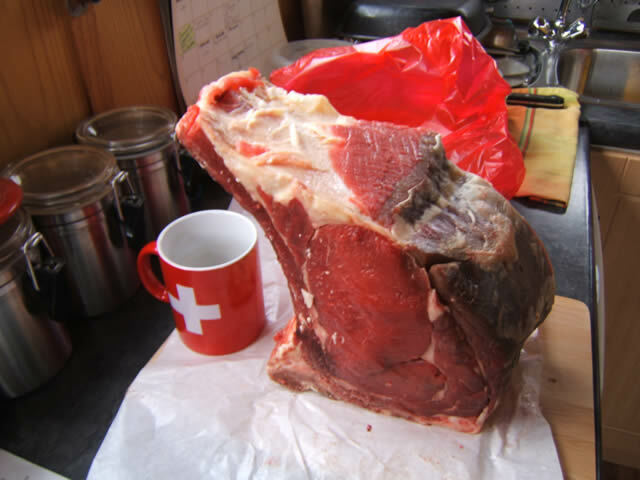 Just after Christmas we were invited round for lunch, it was of course very traditional fayre. Liz had obviously put lots of effort into the day (although we are sure that Paddy played his part as well). But the whole experience was just a little too much for the pets who seemed to find it so tiring. Pamela's sister Pat was due to arrive at the end of December and the trip to Geneva airport is much nicer than the one to Lyon. Over the Jura Mountains, through some pretty ski resorts and eventually some beautiful views as you descend to Lake Geneva. 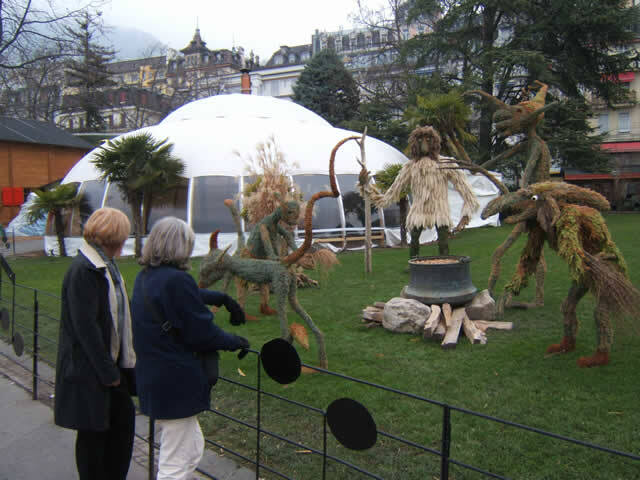 We decided this time that whilst we were in Switzerland we would all benefit from a visit to Montreux on the shores of Lake Geneva. And just in time for lunch too - how fortunate! 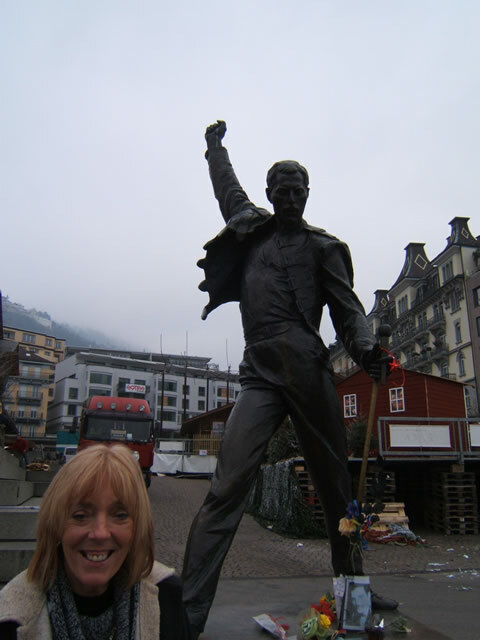 Of course it would be unthinkable to go to Montreux and not visit the statue of Freddie Mercury. So we did just that! 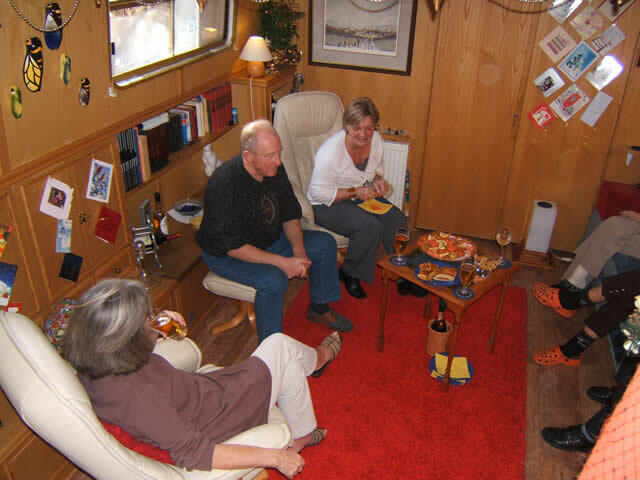 As we said earlier, no apologies for the next photo, taken at a little get together we had here on board Lea Crest. As you will no doubt agree, there is nothing quite so comforting as being inside in the warm when it is cold outdoors. 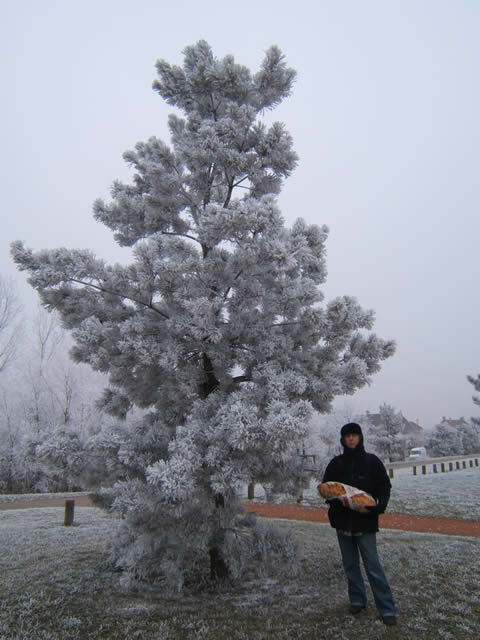 Our next photo shows just how cold it can be here although this year it only got down to around -7 C overnight. 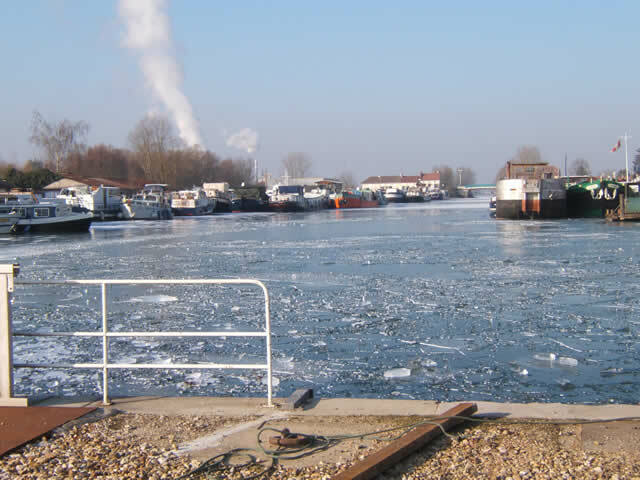 The photo was taken when winter was at its height and the water in the port here froze over for a couple of weeks. But it is not all bad, especially when there is sunshine, and next is a view from the other side of the harbour on just such a sunny day. 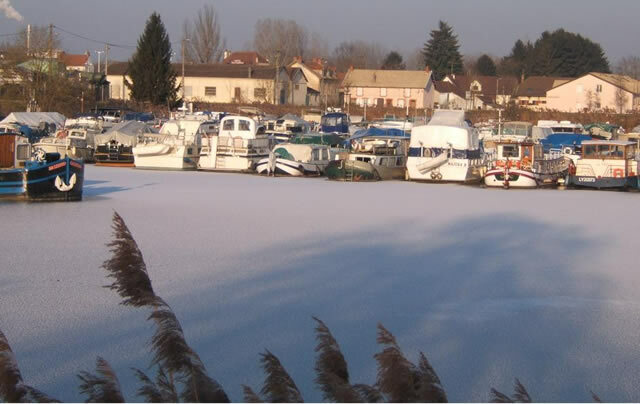 We decided this year to put some extra covers over the boat in an effort to keep the roof clean and us warmer. As you can see, it didn't look very pretty. But it worked and that is what matters! There was plenty of sunshine to go with the cold temperatures this year, making perfect conditions for getting out and about a little more. But of course, mustn't forget to keep wrapped up. 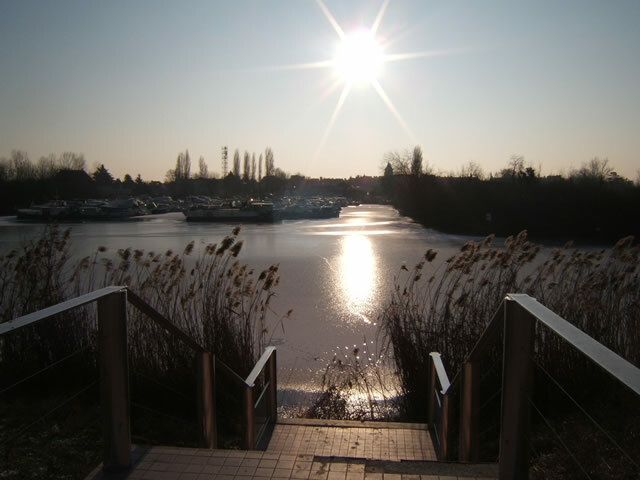 This next photo is of the first part of the Canal de Bourgogne, which is just round the corner from us. 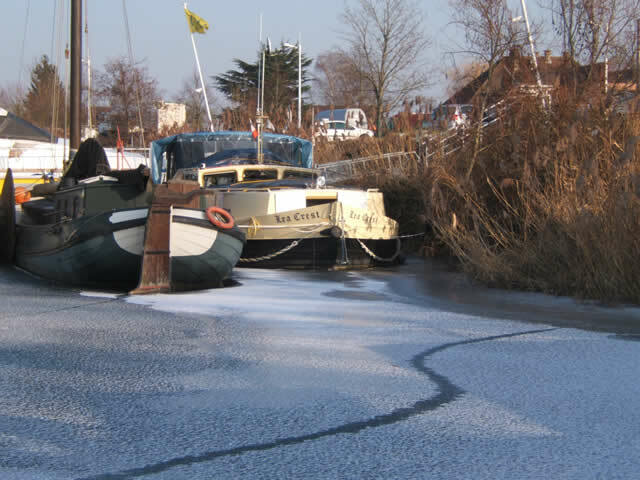 As you can see, the water in the canal was frozen solid which must have been a bit of a bind for the people at the dry dock who had to move boats in and out regardless. 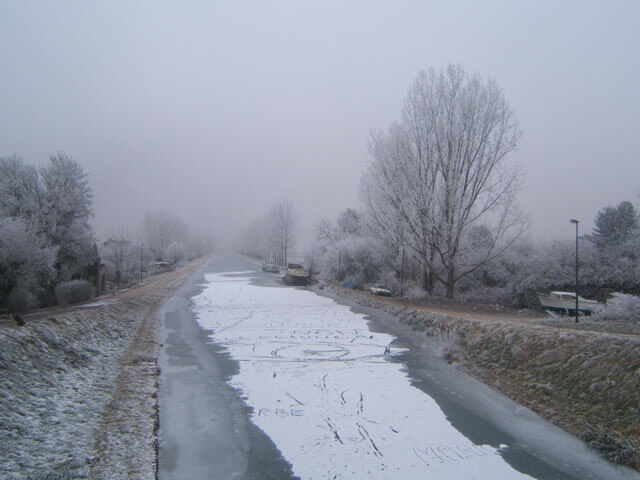 But with a bit of effort they managed and just smashed through the ice as and when needed. Over here in France (certainly in this part anyway) there is a tradition in the month of January involving a cake called a Galette des Rois. It is made of pastry and frangipane and contains a small pottery trinket. The cake comes with a crown (made from gold coloured card) and the idea is that whoever gets the little trinket is the king (le roi). That person can then wear the crown and has good luck (It's a bit like putting a coin in a Christmas pudding in the UK). 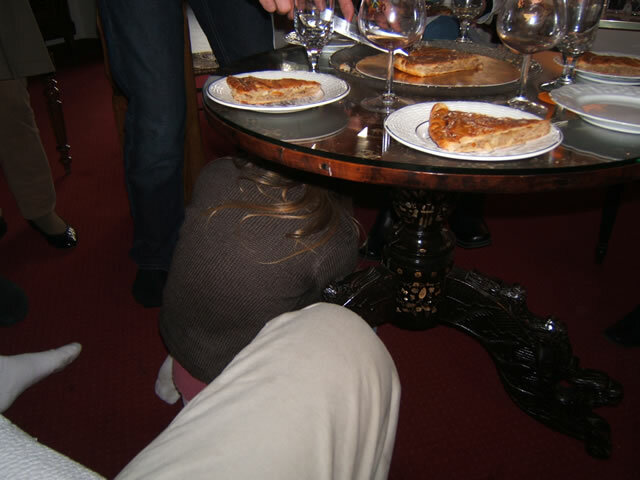 In our next photo you can see Jeanne (the young girl under the table) choosing who should have which piece of cake. Very fair don't you think? This boat used to belong to our good friends Al and Robbie who are now back in Australia. 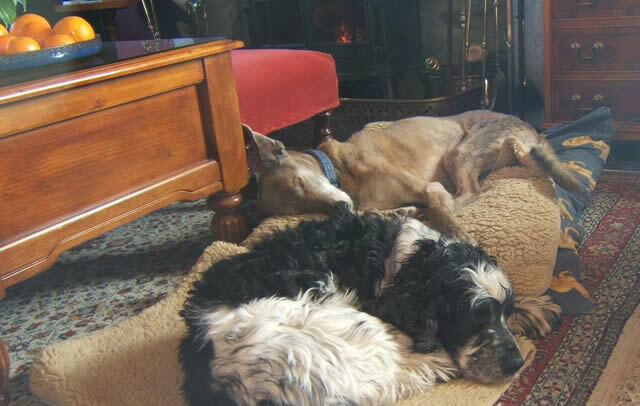 Things aren't quite the same around here without them and Gromit certainly misses the president of his fan club (Robbie). 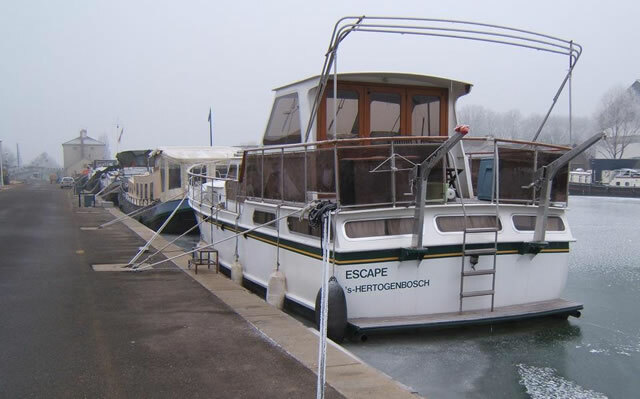 So we just couldn't resist putting this photo in, particularly as the boat is called ESCAPE (when clearly that would not have been possible). As you may know, the French are famous for protesting about things they don't agree with, or don't like the sound of, and they take their right to free speech very seriously. 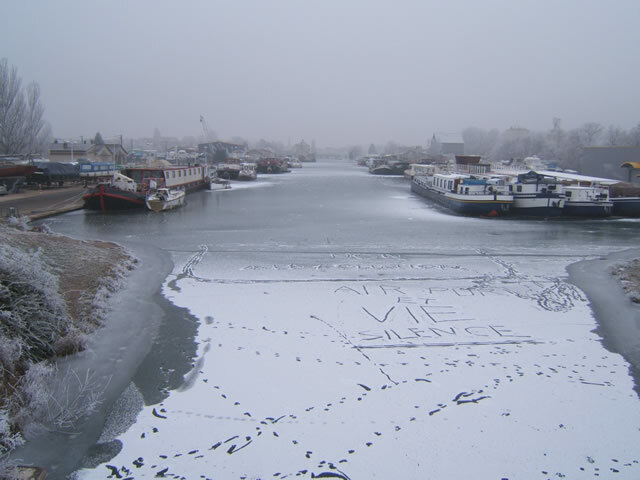 Whoever did the writing on the surface of the ice here was certainly keen to have his (or her) say! Apparently it is part of a localised protest against the suggested expansion of Dijon airport to allow commercial flights to use it. It's a shame they are protesting really as flights to and from the UK from Dijon would be ever so handy for us. At any rate, here is another statement of opposition on a different bit of the canal. You will all have heard the expression "the show must go on". Well over here it's the same principle for the bread. No matter what the weather, the bread must be brought. 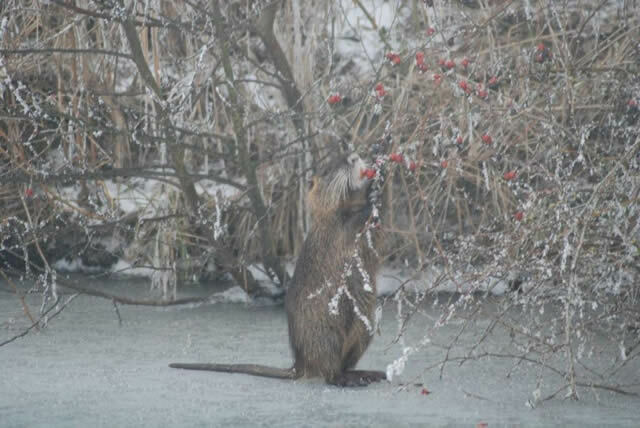 The next 2 photos (taken by our friend Vivienne) are of a local inhabitant foraging for food and as you can see there wasn't much of it about. 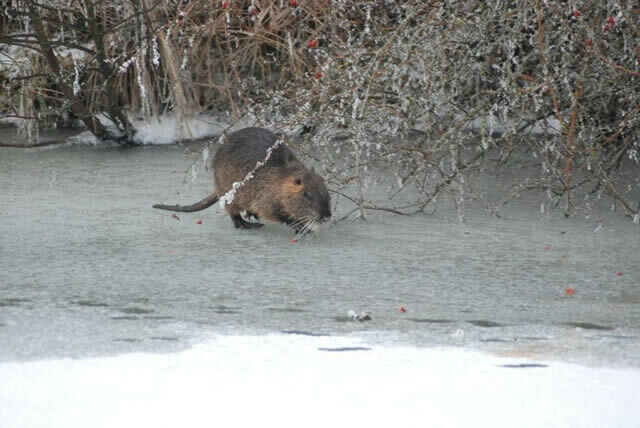 The animal in question is called a coypu and luckily they are vegetarian because this one was as big as a small dog. He (or she) lives on one of the islands in the middle of the Gare d'Eau (the harbour) and it was really special to actually see one in the flesh. In January we had a visit from Peter and Betty, who live in Mirfield where we used to live back in the UK. They called to see us in their Camper Van on their way down to Spain and we all had a great time catching up on things back in Blighty. Here they are in the middle of Dijon. 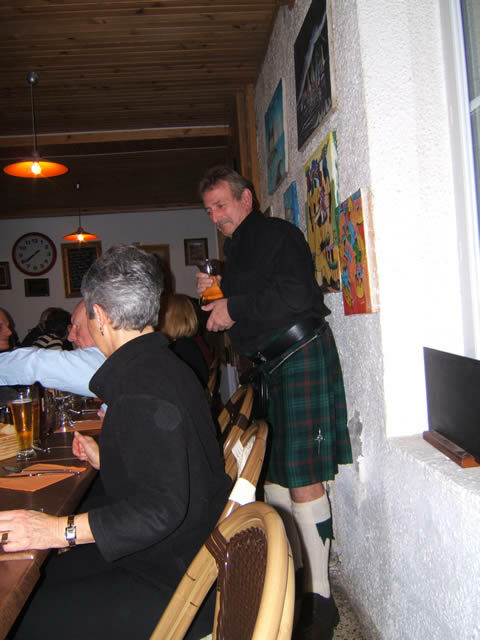 Later in January there was a special Burns night supper at one of the local restaurants with all the things you might expect, including genuine haggis and whisky. But where were all the Scots? As you can see from the next photo, a good time was had by one and all. 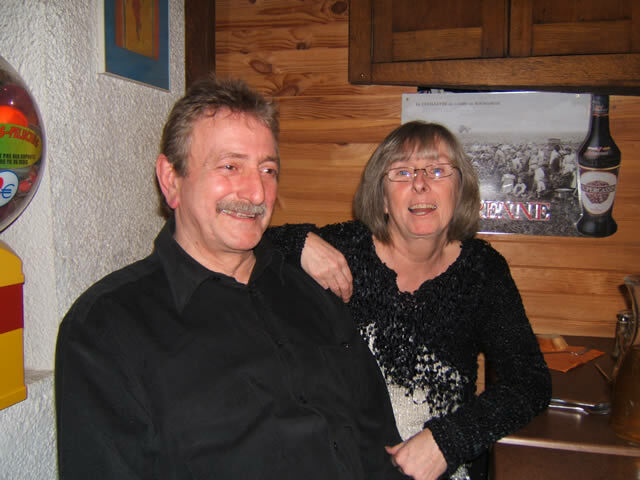 The last of our 30 photos is of our friend Jean-Albert (a French man), supported by his wife Jacqui (an English woman). 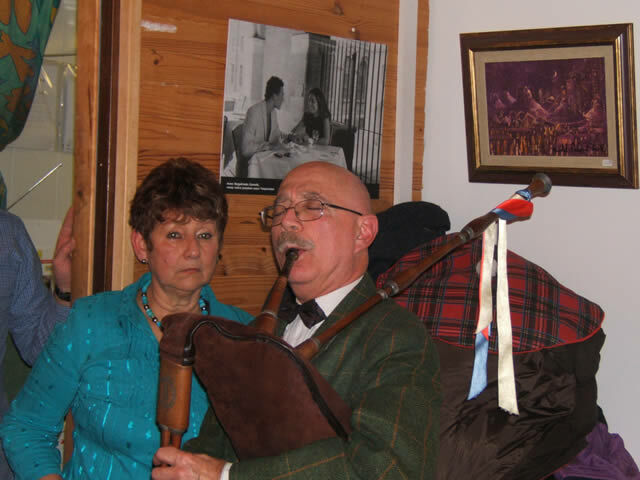 He is playing a lament on the Northumbrian pipes at a Scottish themed event (Burns Night/Supper) in France. Confused? You soon will be! Well that's it for this update and as usual we will promise to try and get another done fairly soon. But as we said before, we are seriously thinking of updating on a quarterly basis in future. After all, everyone must be fed up by now with the same old topics for photos (boats, canals, bridges and us having a good time)?